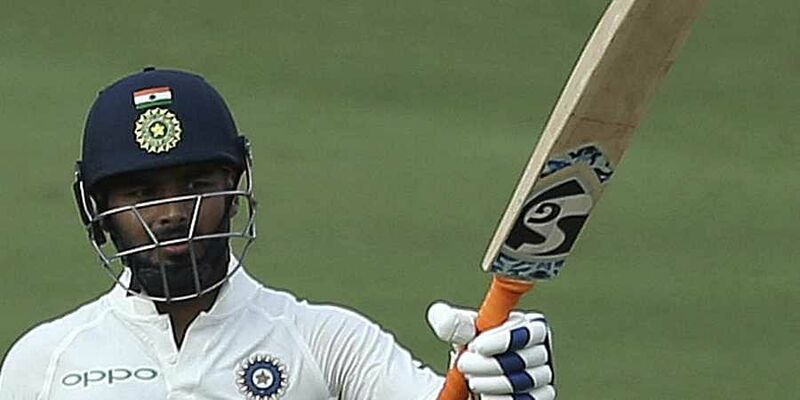 HYDERABAD: Rishabh Pant's audacious stroke-play complemented Ajinkya Rahane's patient approach as India reached 308 for four against West Indies on the second day of the second cricket Test on Saturday. India are now only three runs short of West Indies' first innings total of 311. The Caribbeans could add only 16 runs in the morning session after Umesh Yadav polished off the tail with career-best figures of 6/88 in 26.4 overs. Together, the duo added 146 runs for the unbroken fifth wicket after India lost in-form skipper Virat Kohli (45) to be reduced to 163 for 4. This was after young Prithvi Shaw lit up the morning, smashing his way to 70 off 53 balls to provide an initial momentum. It was a day where India's Gen-Next enthralled the 18,000 odd crowd with spectacular strokeplay. Shaw's cover and off-drive were treated for the eyes. The way he slashed Shannon Gabriel for a six over third man or stood on toes to smash Jason Holder through point was eerily similar to Virender Sehwag's style of play. The 11 fours and a six were out of the top drawer. For Pant, it was more about brute power. He hit back-to-back sixes off left-arm spinner Jomel Warrican (1/76), who had till his arrival had decent figures including the wicket of Shaw. There was a steer and sweep and a slog sweep off the senior leg-spin bowler. When off-spinner Roston Chase dropped short, he cut it ferociously. When leg-spinner Devendra Bishoo flighted the ball, he took a step forward and whacked it through mid-off. He hit 10 fours and two sixes. Pant's approach also gave Rahane time to build his innings even though he never looked in control. However going to Australia, India needed its vice-captain to get some runs and to his credit he hung around to do the needful. The vice-captain hit six fours in his knock. The Indians were also helped by poor fielding from the West Indians. It also didn't help their cause that their main keeper Shane Dowrich got a nasty hit on the knee and reserve keeper Jahmar Hamilton wasn't up to the mark. He dropped a regulation caught behind chance when Pant was on 24 off Shannon Gabriel (1/73) and it did prove to be costly as the youngster started taking the bowling apart. Skipper Virat Kohli (45, 78 balls) missed out on an opportunity to add another ton to his growing list of international hundreds as he looked in no trouble whatsoever during his stay at the crease. He hit the cover drive well and ran the singles as a time when India were in a spot of bother at 102 for 3 after Shaw and Cheteshwar Pujara (10) were out in quick succession. Kohli was the dominant partner in the 60-run stand for the fourth wicket as Rahane was initially struggling to score runs. He was finally dismissed by his opposite number with an incoming delivery. On a reasonably good day, what stuck out like a sore thumb was yet another failure from opener KL Rahul (4), who seemed be batting on a different pitch from his other colleagues. He has now 15 failures in 17 Test innings this year.